Since qualifying in Podiatric Medicine at The Durham School of Podiatric Medicine in 1992 Catherine Hayes has worked within the National Health Service and in Private Practice before becoming a full time academic in the Department of Pharmacy Health and Wellbeing at the University of Sunderland, where she is currently Programme Leader for postgraduate provision and a director of studies for doctoral students. Professional Practice for Podiatric Medicine provides an overview of the challenges facing podiatric clinicians in the United Kingdom. The notion of professionalism and the constructs that underpin service delivery are of increasing concern in the current healthcare climate. The topics covered in this text are timely and relevant to new and current clinicians. Podiatry has undergone many changes over the last two decades, and the foremost change has been an increasing emphasis on professionalism in clinical practice. 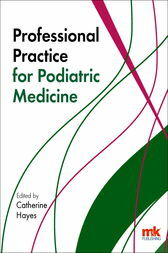 In this book, several experienced podiatric practitioners and healthcare educators contribute chapters on different aspects of podiatry. Principles of leadership and management (which impact on individual career paths) are discussed, alongside the processes of appraisal, work loading and continuing professional development that will shape the future of podiatry.